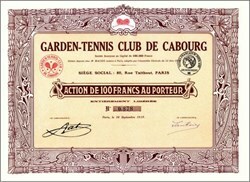 Beautifully engraved Certificate from the Garden Tennis Club De Cabourg issued in 1919. This historic document was printed by the Imp. Lang. 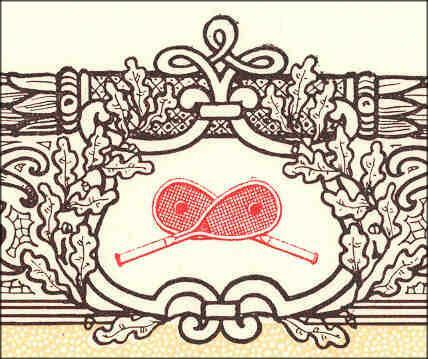 Blanchong of Paris and has an ornate border around it with a vignettes of Old Tennis Rackets and Tennis Balls. There are also 30 unused coupons attached to the bottom of the certificate that are not shown in the scan. This item is hand signed by the Administrator and is over 81 years old. This is the first tennis racket vignette we have seen. A small village situated on the left bank of the river Dives, Cabourg was little more than a series of sand dunes and pastures, inhabited by colonies of wild rabbits. The centre of the village was situated where we now find Cabourg high street, the far end of which used to be closed each night by a wooden door. In September 1853, the destiny of Cabourg changed course. A Parisian solicitor named Henri Durand-Morimbaud, accompanied by his three children and Achile Colin, manager of the theatre of Porte Saint-Martin, took advantage of his holiday at Trouville by seeking out a potential seaside resort in response to the fashion of bathing in the sea. On discovering Cabourg bay and its fine sandy beach, he decided to turn it into the "Queen of Beaches". The two explorers soon decided to found a spa bath at Cabourg. This led to the acquisition of land by the establishment between what is now avenue de la Br�che-Buhot, avenue des Dunettes and avenue Pasteur. Plans for the first casino were laid out. During the harsh winter 1854-1855, Durand-Morimbaud called on the services of Paul Leroux, a young architect from Caen. Leroux mapped out the future resort. His plan was original, consisting of a fan-shaped network of streets emanating from the "Grands Etablissements" (Casino and Grand Hotel), a layout which remains to this day a prominent feature of the resort. From the earth, or more precisely from the sand dunes, grew a new seaside resort which was officially opened on 15th August 1855, after a national campaign promoting the benefits of bathing in the sea. As with all seaside resorts opened at this time, the early days were chaotic. The promoter and the new residents had to confront not only the ravages wreaked by the rabbits on the lime trees, sycamores and other acacias, but also those wreaked by inhabitants who devastated the landscape in their search for firewood. Cabourg became once more a barren range of sand dunes, given the name of "Petit Sahara". Consequently, Durand-Morimbaud's enterprise went bankrupt. Another enterprise came into being under the management of Adolphe d'Ennery and the resort experienced a new period of prosperity. Developments included the construction of a "H�tel de la Plage" in 1861, and in 1867, a new casino was built in stone, replacing the previous wooden structure. At the same time, the number of Second Empire-style villas constructed on the plots defined by the fan-shaped street plan multiplied. 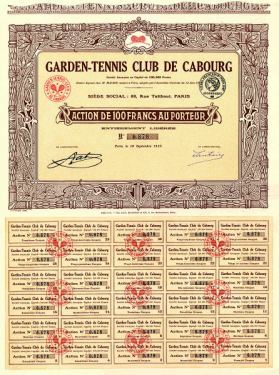 In 1892, Charles Bertrand became proprietor of the "Grands Etablissements". Some years later he rebuilt the Casino and the Grand H�tel as we know them today. With the appointment of Charles Bertrand as mayor in 1896 came the revival of the prestige and splendour of the resort. 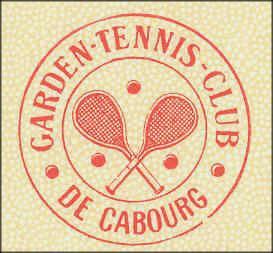 It was during the "Belle Epoque" (period of great prosperity), that new leisure activities emerged at Cabourg (horse racing, golf, tennis�). Unfortunately, the First World War, the death of Charles Bertrand in 1927, the economic crisis during the 1930s and finally the Second World War collectively served to push Cabourg into the shadow of other seaside resorts. However, over the past 25 years Cabourg has been benefiting from the formidable developments to the casino and to holiday complexes, and owing to the inspiration of Bruno Coquatrix, manager of Olympia at Paris and elected mayor of Cabourg in 1971, Cabourg has been modernised and provided with fundamental tourist facilities. The recent renovation of several of these facilities (Casino, Grand H�tel, race course, cinemas) conducted by Didier Van Themsche, mayor of Cabourg 1989-1995, has acted as a prelude to a new era of development.